Efficient, tough, with high specification features and proven technologies, Doosan have once again expanded their product range to introduce the LEKF 20 low level order picker. Designed and built at their special facility in Germany, and with a host of new features, the LEKF 20 aims to deliver high levels of productivity, technical simplicity and great value for money, whilst sticking to the Doosan belief of simple, powerful products with great performance. “The key to order picking is the ease of operation along with the comfort and safety of the operator, and the LEKF 20 really delivers.” Said Wolfgang Dittmer, Managing Director of Doosan Logistics Europe. 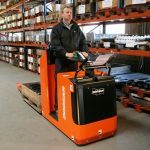 The compact chassis design allows for easy manoeuvrability and better access, whilst the responsive electronic steering and ergonomic tiller arm makes for a superior driving experience for the operator. New pedestrian buttons, featured on the side of the truck, allow the truck to travel forwards and backwards without assistance, allowing the operator to place stock on the pallets without having to continuously get on and off the truck, providing an economical solution and increased productivity. An innovative ‘presence sensing footplate’ allows for constant safety monitoring. By sensing when as person is stood on the order picker the device prevents the inadvertent operation of the tiller arm unless there is an operator on the truck. Located on the outskirts of Berlin, the warehouse manufactures a range of equipment, complete with electronic AC systems, traction control and modern energy management, aimed at the air cargo, beverage and freight forwarding industries, as well as the general warehousing sector. Unlike many manufacturers, the German facility produces much of its warehouse equipment entirely from scratch. Workers are highly skilled in the design and manufacture of products and have vast engineering and fabrication experience. Due to this unique and rare approach, added care and diligence can be taken in adding modified features to individual trucks. Doosan UK sales manager, Paul Watson believes Doosan’s understanding of the fundamental changes in the market place are key to the success of their products. 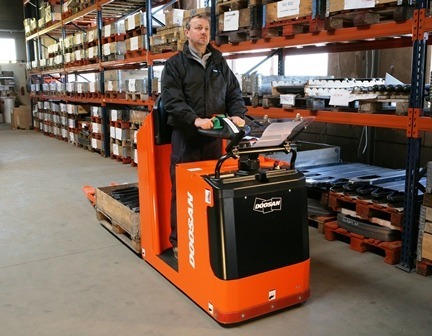 Over 100 Doosan models are available in the UK from 1.5 to 16.0 tonnes (IC models) and 1.3 to 5.0 tonnes for electric models plus the latest warehouse range of pallet trucks, stackers, order pickers and reach trucks. 14 nouveaux chariots élévateurs rejoignent le parc location de Locarmor.